A total of 264 officers will be recruited over the next 14 months. Taxpayers will have to fork out an average of £24 extra a year to pay for frontline policing in West Yorkshire. The raise, which will come into effect in April, will help fund the recruitment of 264 bobbies on the beat, all of whom have to be hired by West Yorkshire Police by March 2020. Police and Crime Commissioner Mark Burns-Williams said he had sympathy for households who are "struggling" financially. The £24 rise will apply to people living in Band D properties and will be billed on the police precept part of the council tax. But for those living in houses which fall into Bands A, B and C - which account for the majority of West Yorkshire homes - the hike will be smaller. Police and Crime Commissioner (PCC) Mark Burns-Williamson said on Friday he sympathised with hard-pressed households, but promised they would see the benefits of the extra cash. He told West Yorkshire's Police and Crime Panel: "This is about investing in what the public want to see, which is more visibility in frontline policing and addressing the challenges that we have. "I'm conscious of the impact on council taxpayers, who struggle on in many instances. The pay rises that haven't come through in recent years and austerity are playing their part. I understand all of that. "But I think they want to see policing much higher up the agenda than where the government have put it in recent years." A public consultation on whether or not to go ahead with the increase saw 72 per cent of respondents support it. Currently, residents in West Yorkshire pay an average of just under £170 a year towards the policing precept - the third lowest total in the UK. 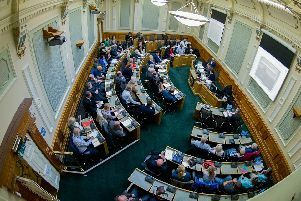 The panel, which is formed of councillors from across West Yorkshire and a handful of members of the public, approved the increase, though the PCC will have to abide by certain conditions. These include ringfencing the number of police community support officers (PCSOs), and having to demonstrate evidence that the extra police on the ground will reduce crime. Some panellists suggested they were reluctant to approve the rise, though it was eventually passed unanimously. Independent Roger Grasby said that if local authorities raised their own part of the council tax as expected, the PCC's own increase would make up "around a third" of the total. Kirklees councillor Andrew Pinnock added: "I don't think we've got a lot of choice but to approve this, but I think we should make sure that the PCC and police keep to the commitment that they've outlined. But Bradford's Tariq Hussain said: "I'm all for this precept on the basis that frontline staff are protected and there's a reduction in crime. "All the information we're getting as councillors is that smaller criminal activites aren't being investigated. "I don't think we can keep going on saying there's not enough money in policing if we don't pass this." Panel chair Alison Lowe said she would write to the government expressing concerns about the "long-term viability" of funding the police at local level.